In a Wellesley house, the seasonal decorations feel glorious, not gaudy. 1 On the mantel, Langlois starts with an artificial garland, then weaves in live pine boughs and pine cones for an ultra-lush look. “It’s one of our favorite tricks,” he says. 2 The organic form of the hand-blown glass light fixture inspired the look and feel of the Christmas tree decorations. 3 Since the family has a live one elsewhere, Langlois chose a high-end, zero-maintenance artificial tree from Frontgate, pre-strung with white lights. 4 Langlois made the tree topper out of feathery wands from Venetian-style masquerade masks he found among the homeowners’ belongings. 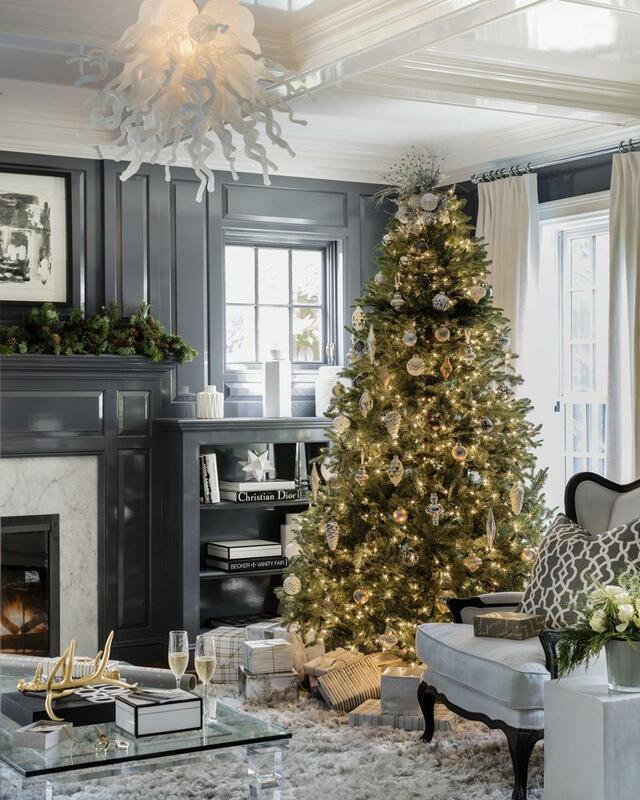 5 Vintage glass pine cones and glass balls hand-painted by local artists in silver, gold, and white patterns give the tree a glistening, monochromatic look. 6 Simple bouquets of white roses and fresh greenery are scattered throughout the house. Unlike that of some seasonal botanicals, the scent is not overpowering. 7 Even the wrapping paper and ribbons, which Langlois buys for clients whose homes he decorates for the holidays, coordinate with the overall palette. 8Brass antlers, picked up at a gift shop in Newport, top the coffee table during the holiday season, simultaneously referencing winter and warming up the black-and-white decor.